A good grooming routine is important. It will help keep your African Violets looking beautiful as well as keeping them healthy. When done on a regular basis, grooming takes very little time. To maintain a consistent routine, many recommend grooming your African Violets as part of your regular watering schedule. Be particularly vigilant to wipe off any water that may remain on the leaves of the crown. Water on the leaves or crown tends to leave residue that can promote the growth of some fungi that are particularly deadly. Dust and dirt on the leaves can be wiped clean with a soft, damp cloth. For other debris, you may want to use a soft-bristled brush, such as a small paintbrush. Damaged leaves and flowers should be removed with a sharp knife. 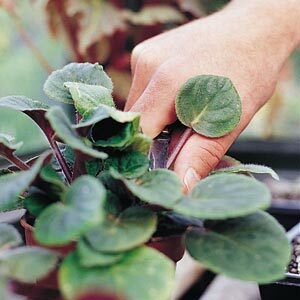 Spent leaves and flowers encourage rot, which can spread to healthy parts of your African Violet. While grooming your African Violets, be on the look out for suckers. If you are trying to maintain the symmetry of a single-crowned plant, suckers should be removed as soon as you see them. The appearance of any unusual characteristic, on your African Violets, should be cause for further investigation. Consult Doctor Optimara to identify any problems and effective treatment options.